Nurse Vanilla is always nice! This artist couldn't have a better debut! This is GREAT! Hmm yes, Vanilla is definitely soft and warm, the perfect description for them feelings you get after reading it. Well hey, when you get a great nurse like her, I'd definitely understand not exactly...wanting to get discharged. But hey, in his case, I feel it'll work out despite him getting discharged. Pregnancy and Marriage. Sequel and Series. No chair, cause she too kuudere. Anyone want a sequal where he works at the hospital as a custodian or clerical worker just to see her again? The WAFF is strong in this one. But seriously, Momono Yuuka has a talent that I am going to enjoy seeing more of in the future. Once More, and with well-deserved Feeling: "HELLLLOOOOOOOO, NURSE!!!!! 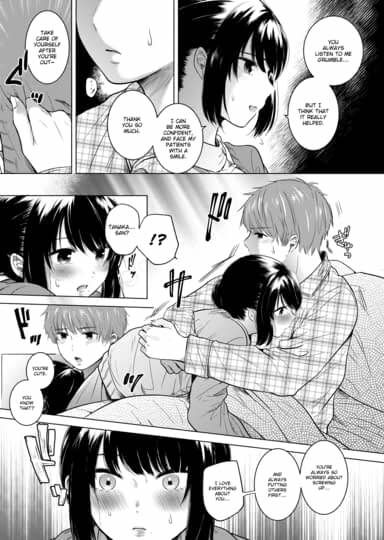 A Most Excellent FAKKU Debut by this artist. I don’t know. But her face reminded me to Netoraserare artist because some similar of her art and design. Congrats on your discharge *coughs unsubtly*. Now go and do stuff for a sequel. I've seen better discharges, maybe he needs another workup. I Want To Be Your Wife! Her feelings... and her body... are in full bloom.